Plot Summary: As Ash and company decide to rest in the city, they let all of their Pokemon out to relax. While Pikachu and the other Pokemon are enjoying their free-time, Ash, Misty, and Brock go to "get something ready". On the top of another neighboring building, Pikachu spies two small Pichus in a slight dilema. 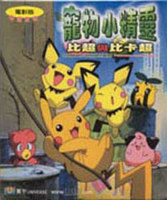 Eager to help, Pikachu rushes to help them and is instantly swept up in their strange adventure.